The following are excerpts from “The Milo Story – Volume II”, by Lloyd Treworgy. Mother Goose may have been right – up to a point. “Early to bed, and early to rise” MAY make a man (or a woman) healthy – even wise. No one can prove, or disprove, either one. But WEALTHY? Come now, Mother Goose, how many did you know personally who were rich because they got up early! Even so, between 1902-1975, employees of the American Thread Company, varying in numbers with the years, DID rise between 4 and 6 o’clock mornings. Those who needed only an hour from bed to mill could, if they wished, wait for the two long and disturbingly audible blasts from the 6 o’clock whistle, to rub the sleep out of their eyes. Waiting for the whistle was probably more popular in winter than in summer. On a mid-January morning when the Arctic mist rose from the river, at Trafton falls, the blasts were sometimes half whistle, half whisper, from the cold. Ah, yes, the warm bed then could be a temptation that only the need for the paycheck could resist. The American Thread Company was an exceedingly important industry in Milo, in those days. For a decade before World War I (1917-18), and for a decade after it, ATCO was a name to reckon with. Its wages weren’t high, but the firm gave steady work to as many as 300 persons during its most active period; and used something like 10,000 cords of white birch annually. There is, indeed, a photo, in the possession of Lewis Mountain, a once boss-teamster for the company, showing 10,000 cords of birch piled up at one time in the millyard, which extended from a little above the site of today’s Penquis Valley High School buildings to the river. 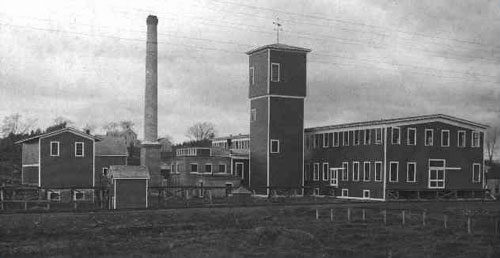 In an August 20, 1975 story published in the Bangor Daily News, about the closing of the American Thread Company’s operation in Milo, Betsey Shirley noted that in a period including the first World War, the Milo and the Lake View mills, both spoolmakers, together used 20,000 cords of birch annually. Out of the scores of thousands of cords of birch milled, in the 70-plus years of ATCO’s sojourn, company estimates were that three billion, six hundred million spools, bobbins, etc., of various shapes and designs, were shipped out. That’s a small number, maybe, compared to McDonald’s current hamburger total – but creditable, coming from so local a source. Even more impressive perhaps, than the breathtaking count of finished spools, was the enormous ratio of waste to perfect spool. The spool first surfaced in the “bolt” – the plank stripped by rotary, or snapdragon, or “bolter”, from the 4-foot birch log. The bolts were squared into spool bars, and “stuck” in piles outdoors, to dry over summer. They were then packed in the stock sheds until wanted; kiln-dried, to draw out the last responding drops of moisture; rounded, gang-sawed into spool-size blocks; finished, bored and sorted. These sortings, in fact, followed every process in manufacture, from bolt to finished spool – accounting for the rejection, and discarding for fuel, of the greater part of the original 4-foot birch log. So great was the percentage of waste, indeed, that each perfect spool was said, with pardonable exaggeration, to be “worth its weight in gold”. Along with the impressive estimate of finished spools, and the equally impressive statistic on rejection of unacceptable wood, was another extraordinary fact. Among the papers of E.M. Hamlin, manager of the mills for thirty-seven years, was this brief notation: “The American Thread Company makes 4600 kinds of thread”. And the mills in Milo, and at Lake View, were the sole spoolmakers for the company. The mind-boggling number 4600, could, of course, have included colors as well as sizes. And, no doubt, several varieties of thread could use the same size of spool for winding. Spools were rigidly standard. They couldn’t be permitted to vary, in a stated lot, by the width of a thread! John E. “Jack” Masterman, multi-term Representative to the State Legislature, and once spoolmaker and the office worker for ATCO in Milo, told the author that in all probability, the number of varieties of spools, bobbins, swift sticks, plugs, copper spools, tube spools, bull spools, etc., made at the mills, was nearer 1000 than 4600 – an impressive statistic, however one looks at it! A considerable amount of waste, in Milo, the company burned it its own furnaces, at the spool mill, and at the saw mill, to generate the steam that for years powered its engines. Another large portion of its waste – spools, blocks, edgings – went into the stoves of employees and, when available, the stoves of the general public. Until close to 1950, most kitchen stoves in town were wood-burning. This state of things continued until the wastewood from ATCO lessened – or, perhaps more accurately, until dirt- free electric energy, the labor saving switch, and more constant heat, brought the electric stove into general use. Until the changeover from wood to electricity, most Milo homes had a bin in the basement for spool wood; a couple of coal scuttles beside the stove to hold spool blocks brought up from the gin; and a container beside the fireplace for edgings. Edgings resulted from the squaring of the 4-foot bolts into spool bars, and from the over-plentiful red heart in the birchlogs – pretty, but unacceptable as spool material. The company stayed on in Milo for three decades, though the rumor of its imminent moving continually recurred. A second Board of Trade was organized because of the persistent rumor. This second board took for its purpose the seeking out of new industry for Milo, to take ATCO’s place. The town’s economy, however, continued much as it had been. The Board of Trade began to take on as a subsidiary interest, Major League baseball players, and gradually withered away and died. Lukewarm industry offered no exciting hope to the town, nor did the constant rumors about ATCO’s plans to move, oppress with any sickening fears. Milo continued at an endurable economic level. When Dwight L. Hamlin, last ATCO manager in Milo, wrote the company’s history for the Milo’s sesquicentennial celebration, in 1973, there were still 55 full-time employees on the company’s payroll. By that time, the mood in town had changed from fear of ATCO’s leaving, to hope that it might sell its property to some larger operator – even perhaps in some other industry. Such hope, in small measure, materialized, when ATCO sold its mill and office building in 1975, to Milo Woodcrafters, Inc., locally known as Basketville. Details of the sale, as set down in the Registry of Deeds office, gave the selling price as $90,000. *In 1987, Ox-Yoke Originals, a gun cleaning manufacturer, purchased the building. *Today the building is home to Three Rivers Hardware.